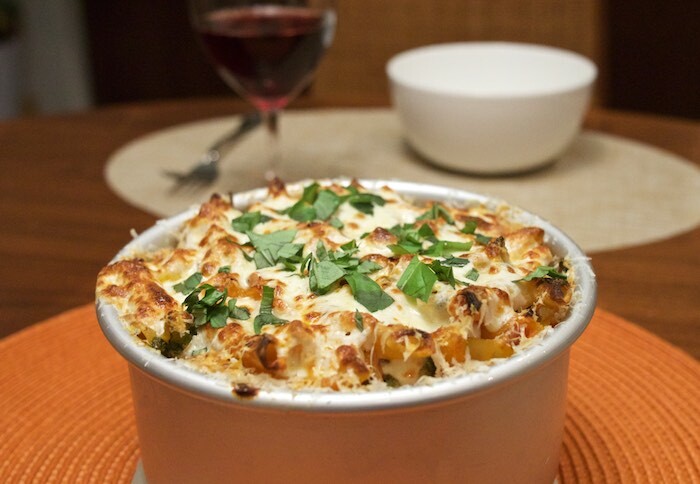 This hearty baked pasta is loaded with veggies and cheese and tied together with a smidgen of tomato sauce. Though utterly delicious it's not like any baked pasta I've had in the past; most of which featured meat versus vegetables. Preheat oven to 375°F. Cook pasta according to package directions. Drain and transfer to a large bowl and drizzle with olive oil. Heat some olive oil in a large nonstick skillet over medium-high. Add chopped zucchini and cook, stirring occasionally, until lightly browned on all sides, about 4-5 minutes. Stir in the chopped spinach and cook until wilted, about 1 minute. Season with salt and pepper and add to the bowl with pasta. Mix together, egg, ricotta cheese and a pinch of salt until incorporated. Stir cheese mixture into the pasta and veggies. Add the 1/2 of the diced mozzarella cheese and half of the grated Parmesan cheese, toss to combine. Stir in chopped tomatoes until pasta is coated. Transfer mixture to an oiled 6-inch pan and place on a baking sheet. Bake until set, about 30 minutes. Top with remaining mozzarella and grated Parmesan cheese, and return to oven. Bake until golden brown, about 5-7 minutes. Remove and let stand 10 minutes. Scoop into bowls and serve topped with fresh basil.